The Nuremberg artist Erhard Schön (1491–1542) was a pupil of Albrecht Dürer. When he adopted Lutheranism in the 1520s, he began designing woodcuts for anti-Catholic books and broadsheets. This is one of his most well-known satirical efforts, the devil playing the monk – with bagpipes (wind) featuring. Like cartoons today, this rather grotesque image was designed to amuse and enrage. 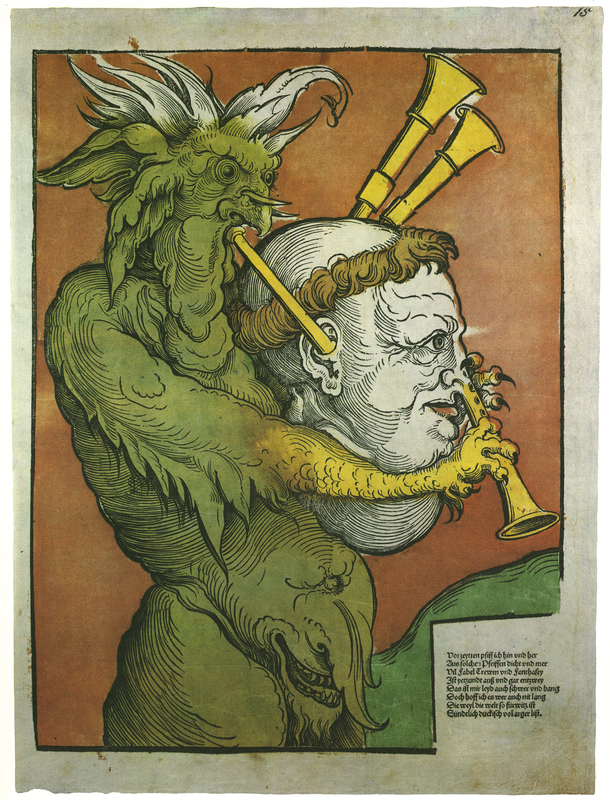 Erhard Schön, “‘Der Teufel mit der Sackpfeife’ [The Devil playing the Bagpipe], [Nuremberg], 1535. Facsimile from Flugblatter der Reformation und des Bauernfrieges,” ourheritage.ac.nz | OUR Heritage, accessed April 26, 2019, http://ourheritage.ac.nz/items/show/10393.